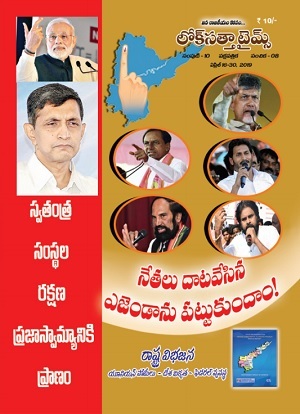 The Loksatta Party today unveiled its 2014 election manifesto which promises a bright future for the people of both Telangana and residuary Andhra Pradesh States. Releasing what is called the people’s manifesto, Loksatta Party national President Dr. Jayaprakash Narayan said that the time has come for ending politics of dynasty, corruption, centralization, divisions and freebies and refraining from repeating past mistakes. 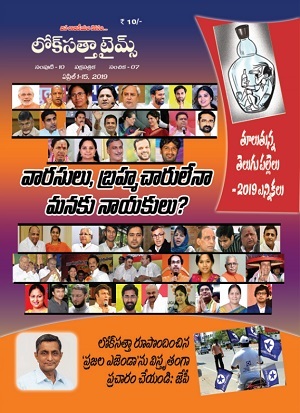 The Loksatta has drafted its manifesto not with an eye on garnering seats and votes in elections but on providing a detailed road map for facilitating development, welfare and reforms. In reply to a question, Dr. JP said that the Loksatta would contest only a limited number of seats, mostly in urban areas, as the political atmosphere in the two States is surcharged and the time available for it is short. It would release its policy paper on electoral alliances tomorrow. In reply to another question, Dr. JP said that he had received suggestions from many quarters that he contest for the Lok Sabha in the context of Parliament endorsing Loksatta’s amendments to the AP Reorganization Act and his track record in bringing about reforms at the national level. Many leaders of major parties, citizens from all walks as well as friends and well wishers feel that he could make a greater contribution if he were to be present in the Lok Sabha. In case he were to contest for the Lok Sabha, he would do so from Malkajgiri. On the demand for changing the Polavaram project and opposition to GM crops, Dr. JP said such issues should be left to subject experts and not muddied by politicians. Eradication of corruption: A strong Lokayukta and Ombudsmen at the district level will be formed and the corrupt will be jailed and their properties confiscated. Citizens’ charters will be implemented to ensure hassle-free services. Basic amenities: With a per capita grant of Rs.1000 to wards in villages and towns from the State budget, people will be enabled to have access to basic services. Healthcare: Every family will be provided free healthcare in both Government and private hospitals. Education: Every student will be provided education including computers and English language. Liquor menace: Liquor trade will be nationalized and shops limited to towns and mandal headquarters. Belt shops will be eliminated and de-addiction centers opened. Pensions will be provided to families of liquor victims. Youth: The party will ensure good education, skills and livelihood opportunities to all youth. Senior Citizens: Their services will be utilized in the fields of education, health and agriculture sectors. They will be provided 25 percent concession in bus fares. Middle classes: Assistance will be provided for realizing their dream of a house of their own in the form loans at subsidized interest and sale of Government lands at cheaper rates. Unorganized workers: Welfare boards will be created for workers like masons, carpenters, electricians, mechanics, petty traders and sales staff. They will be provided monetary assistance for their children’s education and interest-free loans for pursuing their professions. The aged will get pensions. Agriculture: Farmers will have the right to sell their produce anywhere without any restrictions. They will be helped to get better prices through encouragement of foreign direct investment in retail trade. The National Rural Employment Guarantee Scheme will be extended to the agriculture sector. Col storage facilities will be provided and agro industries encouraged. Electricity: Twenty-four-hour power supply will be ensured in the next thee years. Steps will be taken to ensure there are no hikes in power tariffs for the next five years. Industry: Industrial units will get fast clearances. Allocation of land and other resources will be transparent. Loksatta Party leaders Katari Srinivasa Rao, Bandaru Ramamohan Rao, Y. D. Rama Rao, V. Laxman Balaji, V. Vijayender Reddy and Mrs. K. Gita Murthy took part in the media meet. Very vague statement with no coherence. For example, how do you plan to ensure round-the-clock power? How will power be supplied to agricultural segment? Looks like Loksatta is concentrating more on Malkajgiri and Hyderabad assembly segments. Well, Some where they have to start. no details about Bhimavaram candidate?? i saw a van with whistle symbol a few days ago in town, what happened? ?